. :: The Perils Of Show Jumping Sport - 20 ::. Well a few weeks in the life of the Sycamore Stables squad are a bit like dog years; we can achieve so much in a short space of normal people’s time scales!! The stress and strain of the preparation for the Olympic team qualifier in UAE is finally over. The outcome was not as the Egyptian team would’ve liked, being runners-up to the awesome force which was team Qatar, but the proud Egyptian Eagles put up a strong fight and in terms of budget, horsepower and financial support, they fought way, way above their weight to come home a credible third place overall in this Furiusiyya Nations Cup competition. It took place in Abu Dhabi during the President of the UAE Show Jumping Cup and was the sole Furusiyya qualifier for the Middle East. It was a long and difficult trip to arrange as this time of the year most European based riders use the winter months to migrate south like the birds, with our younger, inexperienced horses, to set up base camp at one of the many specialist Sunshine Tours which have been emerging over the years. Sycamore Stables are based this winter in the beautiful Algarve, at the Atlantic Tour in Vilamoura, Portugal. So with twelve horses, two lorries, trailers, three riders and various grooms to organise, it wasn’t easy to throw into the mix getting Sumas Zorro from Ireland to her flight in Amsterdam to Dubai at the same time as all this madness was occurring. And of course, as usual there’s always a few little hiccups thrown into the mix to keep us going; I promise at one stage on Friday 13th I was starting to believe the whole cursed date theory as one thing after another was sent to delay us...From the lights on the trailer malfunctioning, to missed boats - it was like a comedy of errors, but eventually we got the horses en route to where they were supposed to head. However the most epic fail of the whole trip had to be when Sam arrived at Lisbon airport having left the yard in “faro-at-omigod-o-clock” to ensure he was on time for his flight, to find out that his visa to Dubai had still not come through and he wasn’t allowed to board his flight...Then I received news that Zorro had landed safely in Dubai but had promptly leapt of the ramp of the lorry.....onto our groom Jacek’s ankle! So I had me with the horses in Vilamoura (I was travelling a day later to Dubai to give our other rider Catriona a hand organising the show there), Sam stuck in Lisbon, Jacek en route to hospital in Dubai, Zorro home alone in the Middle East, and our poor Manager Anne Marie in the yard in Ireland trying to help me sort it all out....I wasn’t sure who to try to help first!! However, as usual, somehow we managed to pull it all together. The other Egyptian grooms helped us out with Zorro which was much appreciated, while Sam and his other team mate Abdel Said - who was also stuck with the same problem of no visa in Belgium - finally got to travel the next day, and I flew twenty four hours later from Lisbon to Dubai to meet up with them all. It was a hectic few days - on arrival we were greeted with temperatures of 36 degrees, a big shock for both us and horses, and Nations Cup day was to occur in the middle of the hottest part of the day, at 1pm! The horses coped amazingly though, and Sam and Zorro opened the Egyptian account with a super first round finishing on a very unlucky four faults, with a very early pole just rolling over the big water Oxer at fence three. Next in for Egypt was Mohammad Talaat on the beautiful easy jumping stallion Connaught, who returned with two time faults and it still at the halfway stage, looked like anything could happen. It was becoming apparent though that the Qatari team had done their homework and rider after rider returned clean jumping scores, although the time was catching them out. The pressure was on for the one Olympic team place, but with Abdel Said posting another super round for Egypt with again just one pole down, the Qatar team realised that it wasn’t quite a walkover and that one bad round would see the Egyptians ready to pounce and try to wrestle the lead from them. Unfortunately, the last horse in for Egypt was the big jumping and scopey Amelia - and Karim El Zoghby hadn’t quite get into their stride yet and theirs was to be the drop score. Meaning Egypt entered the second round on a respectable score of ten faults, in second position behind Qatar at that stage for the Olympic qualifying place. The second round started quickly and Sumas Zorro and Sam were determined to show the competition a clean pair of heels - Zorro now confident of the course and arena soared around this big track making it look very simple indeed to return only the second clear in the competition to date. The Egyptian camp heaved a collective sigh of relief and we all just dared slightly to dream maybe...Just maybe? It was not meant to be however, the Qatar team came back stronger than ever and deservedly won a very tough Nations Cup to take not only the Olympic place for the Arab region, but the Furusiyya Nations Cup itself, qualifying them also for the series Final in Barcelona next September. The rest of our squad jumped the second round admirably, and the guys were really pleased to end up in overall third place, behind Ukraine and runner up in the Olympic qualifying place. This was a really fantastic effort though for the team and it was lovely to see how everyone pulled together and worked as a team. I had so much fun and laughs throughout the trip, and we all agreed that the squad had grown from their first outing together as a team at the Alltech FEI World Equestrian Games 2014 in Normandy back in September. 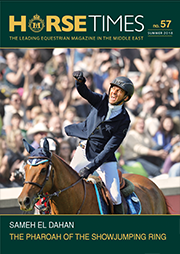 For the first time in a long time, team Egypt has a very strong core group of riders and horsepower - which can be seen with their appearance in the Longines FEI World Rankings with two of them inside the top hundred and fifty in the world and many others just slightly outside this and advancing all the time. The future looks very bright and although they won’t have a team for the 2016 Olympics in Rio, it is looking very optimistic that they can hopefully qualify at least one individual. We now will certainly be doing our utmost to chase for an elusive place; it's going to mean even more running around the globe for the WKD Show Jumping Team.... And I suppose that means a lot more entertaining thrills and drama on the journey. It's going to be a very long year!!! Photo 3: It wasn't all hard work in Dubai with the kids enjoying their unusual surroundings. !